Doctors have been using radiation to treat cancer for more than a hundred years, but it’s always been a delicate art to direct treatment while avoiding healthy tissue. To help them, scientists with the University of Chicago have designed an army of tiny flower-shaped metal-and-organic nanoparticles that deliver a one-two punch—first boosting the effects of radiation at the tumor site and then jumpstarting the immune system to search out any remaining tumors. The research, published March 26 in Nature Biomedical Engineering, led to a candidate molecule currently beginning phase 1 clinical trials. Wenbin Lin, the James Franck Professor of Chemistry and Radiation & Cellular Oncology at the University of Chicago, has been working with a class of materials called metal-organic frameworks (MOFs) for more than 20 years. These spongy materials are so named because they combine metal nodes with organic binders. A hot item in chemistry today, they are under investigation for applications from solar cells to sensors because they’re highly functional and can be built with a number of different components. Because they can be made out of biodegradable materials, Lin’s lab saw potential for a new cancer treatment. The idea is to inject the little frameworks into the tumor. “Upon X-ray irradiation, they produce very reactive molecules which don’t travel far from the injection site—they latch on and stay right where you put them,” Lin said. 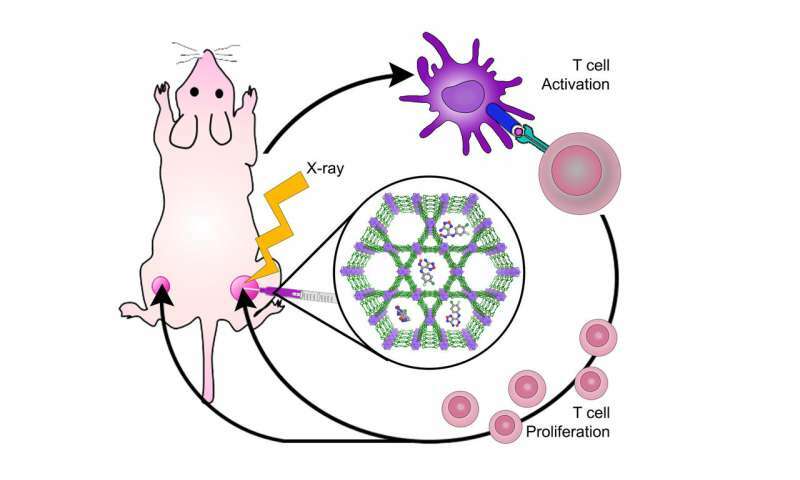 The frameworks absorb radiation better than tissue, delivering an extra dose of radiation to the tumor. Then the second punch: The MOF design can incorporate a type of molecule called an IDO inhibitor. This inhibitor, from a class of cancer treatments called checkpoint blockade immunotherapy, thwarts a common trick that cancer cells use to evade the body’s immune system. Once the blockade is engaged, T-cells can rush in to attack. In mice, the study found this helped kill tumors hiding elsewhere in the body—not just at the site of the injection. “That’s the really great thing about the University—that my oncology lab can work together with physical scientists to advance a cancer treatment like this,” Weichselbaum said. Lin founded a startup to bring the technology to application called RiMO Therapeutics, with assistance from the Polsky Center for Entrepreneurship and Innovation. The company is sponsoring the ongoing phase 1 clinical trial.